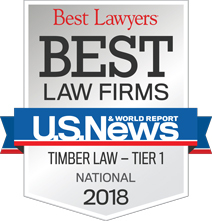 Ranked as a Tier 1 timber law firm by U.S. News-Best Lawyers, our Forest Products Group is one of the largest in the nation. Schwabe has been consistently ranked by U.S. News-Best Lawyers as one of the nation’s top timber law practices every year beginning in 2011, including “Law Firm of the Year” in 2018, 2015, 2013 and 2012. With over a century of experience, Schwabe has worked on timber-related transactions and projects throughout the United States. Our clients include forest landowners, forest products manufacturers, and other industry participants who collectively own or manage millions of acres of forestland in the United States. Consistently ranked by U.S. News-Best Lawyers as one of the nation’s top timber law practices, our Forest Products Group is one of the largest in the country. To stay abreast of industry developments, we draw on an extensive network of contacts, experience and institutional knowledge. As part of our commitment to the industry, we have established our own “Forest Products University,” an internal education program that gives our lawyers a comprehensive understanding of the trends and issues affecting our timber clients. We build on our knowledge through client site visits and in-house presentations, which are based on a robust curriculum covering myriad topics, such as log marketing and procurement, manufacturing, commercial operations, industry business considerations and regulatory environments. We deeply value our connections to the forest products industry and are proud to be involved with the following organizations: American Forest Resource Council, Hardwood Plywood and Veneer Association, Northwest Pulp and Paper Association, Oregon Forest and Industries Council, Washington Forest Products Association and the World Forestry Center. In addition to our commitment of time, we annually sponsor the “Who Will Own the Forest?” Conference, the American Forest Resource Council Annual Meeting, and the Community Forest Forum. Negotiated agreements related to the operation of timberlands, such as road use and maintenance agreements, rights-of-way and easements, log and fiber supply agreements, logging and hauling contracts, leases, access permits and licenses. Negotiated and documented loans secured by timberlands and manufacturing facilities and products. Negotiated conservation easements, forest carbon transactions and alternative revenue stream transactions (e.g., highest and best use sales, wind, and solar and other energy projects). Advised timberland and TIMO clients with respect to capital formation process and private placements of timber-related investment funds. Negotiated timberland investment management agreements. Advised on tax and regulatory compliance issues related to ownership of timberlands and mills. Conducted and oversaw environmental audits. Consulted on environmental issues related to forestland and mill ownership and operations, including agency negotiation and related remediation and cleanup. Assisted with litigation and alternative dispute resolution of forestry and forest product disputes. Defended or prosecuted claims on behalf of timberland owners involving a variety of matters, including adverse possession, timber trespass, land use, and tort and breach of contract claims. Defended against workers' compensation claims. Helped develop, refine and tailor forestry-related policies, including Forest Stewardship Council, Lacey Act and chain-of-custody strategies. Assisted with product distribution, including warranties, disclaimers, labeling and CARB and Proposition 65 disclosures and Internet limitations. Formulated intellectual property acquisition, licensing and enforcement strategies, including patents, trademarks and protection of trade secrets and knowledge. Advised on lumber grading standards, certification marks protection and products liability defense. Advised on antitrust issues related to timber and log purchasing and product sales, including private party litigation, agency investigation and criminal prosecution. Interpreted current law and policy trends in the area of sustainable forestry and advised on issues concerning carbon sequestration, biomass facilities and contracts, the BCAP, conservation easements, water resources, ecosystem services and community forests. Defended plywood manufacturer in Comprehensive Environmental Response, Compensation, and Liability Act (CERCLA) and Model Toxics Control Act (MTCA) administrative process for historical plywood resin waste generated from its facility. Litigated tribal sovereign immunity issues in a variety of federal, state, and tribal courts. Defended forest product companies in Clean Water Act litigation targeting sawmills and log sort yards in federal district court and before the EPA’s Environmental Appeals Board.